Derny is a term that has become synonymous with small pacing vehicles for bicycle racing, but the company itself was more than just jargon. Born out of a French craze for motorized bicycles during the 1930s, Derny debuted its first model, the “Entraineur” in 1938, to pace the Bordeaux-Paris race. Common to all Dernys is the cylindrical fuel tank placed under the handlebars. The gearbox, clutch, and flywheel are unique to Dernys as well; they pull evenly at all revs, allowing speed to be precisely controlled using the throttle and pedals. This is absolutely crucial when pacing the rider following. In 1939, a “civilian” version appeared, with no rear fender (pacers had a fender over the rear wheels to avoid contact with the racer behind them). Production halted during World War II. The “Cyclotandem” (two-person bicycle, seen here) was introduced in 1949, using the same Zurcher engine but with a straight-cut gear transmission, making more noise than the exhaust! 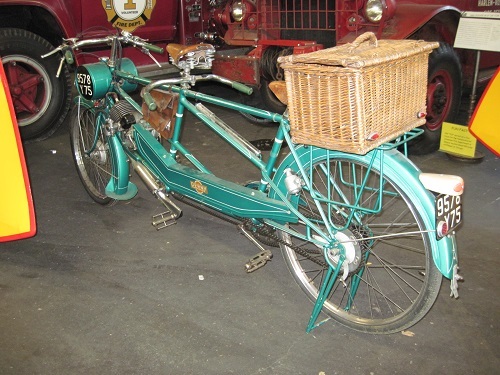 This 1950 Cyclotandem is a part of this exhibit because it was owned and ridden by Marcel Leyat during his later years, usually accompanied by his daughter.